Crab rangoon are crispy deep-fried wontons stuffed with a seafood and cream cheese filling. A popular appetizer found on the menu of most Chinese restaurants, but they’re easy to make at home. Serve with a sweet and sour sauce and you’ve got a crowd-pleasing starter! Whenever our family goes out to our favorite local Chinese restaurant, crab rangoon is always a very tempting option when scanning the starters. There’s something delightful about the contrast of rich creamy seafood filling embedded in a crunchy deep-fried shell crust that makes for a fun and fancy culinary experience. Thankfully, making these appetizers at home is quite easy! The filling is a simple blend of chopped crab, cream cheese, chives, salt, and pepper. To keep the tasty filling locked into each wonton, the folding technique is critical. But don’t worry, I’ll show you my step-by-step method. Frying the wontons briefly until golden brown ensures the most crackling exterior. Serve these edible bundles with some sweet and sour sauce and watch them disappear! What ingredients are used in crab rangoon filling? I use canned crab meat that you can find refrigerated at most grocery stores and specialty Asian markets. 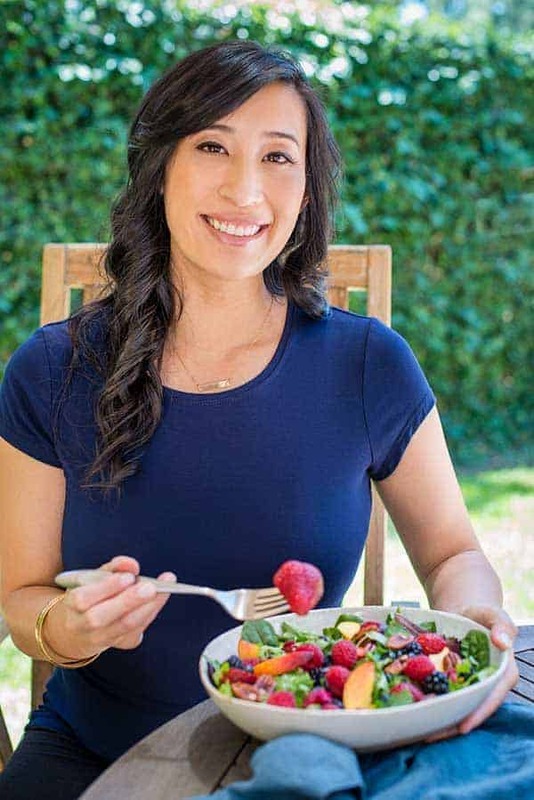 Imitation crab can also be substituted, which is a cured surimi, or cooked seafood paste that is more affordable than real crab, and is often used in California rolls. Just make sure to chop into smaller pieces if using imitation. Cream cheese is added as a rich dairy base for the filling, along with chopped chives, salt, and pepper for seasoning. Mix the filling ingredients by hand until thoroughly mixed, or toss everything into a stand mixer for a faster blending option. How do you make easy crab rangoon? Mix ingredients for crab and cheese filling. Add filling to the center of each wonton. Brush edges of wonton with water for stickiness. Fold and press wonton together to create a purse shape. Deep-fry crab rangoons until golden brown in color and crispy. 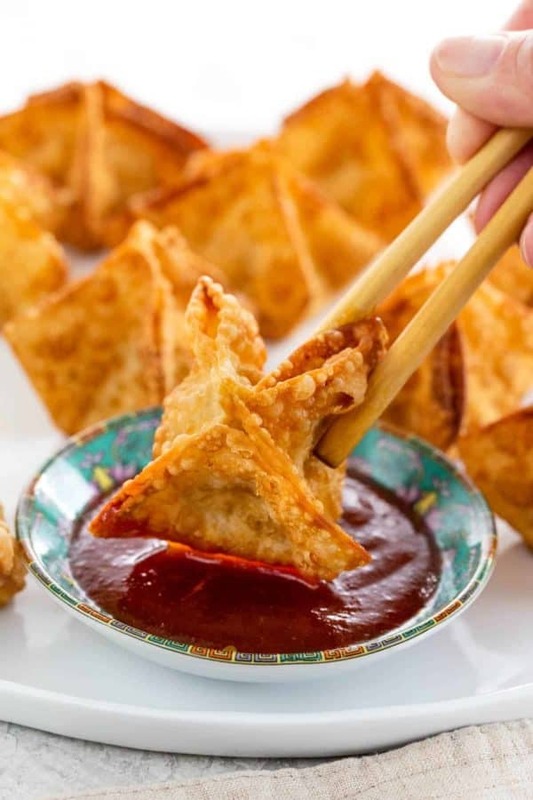 Crab rangoon is not a traditional Chinese recipe as dairy products are seldom used, but its gained popularity in American Chinese restaurants. I serve them with my homemade sweet and sour sauce, it’s a must-have condiment. The tangy sauce brings out the flavor of the crab filling. These crab and cream cheese filled wontons can also be made ahead of time and refrigerated or frozen for a quick appetizer. How do you shape crab rangoon? The recipe uses square wonton wrappers, 3 ½ x 3 ½-inch in size which fits 1 tablespoon of filling. If you find it difficult to fold or want less, 2 teaspoons also work well. The wrappers have a light dusting of cornstarch on the outside which helps to seal the edges when brushed with water. For a purse shape, bring all four corners to center, then press the adjacent edges together to seal. Make sure to remove any excess air from inside so the shape and filling stay intact during the frying process. Other folds like a simple triangle or tortellini-style, as I use for my wonton soup also look nice. How do you fry the filled wontons? Deep frying is the best way to cook crab rangoons. Cooking in a generous amount of oil allows the wontons to fully submerge and cook evenly. This can be done is a large pot or wok. A high smoke point oil like canola or vegetable should be maintained between 350 to 375ºF (177 to 191ºC). It only takes a minute or so for the wontons to become a golden brown color and super crispy. I work in small batches of about 4 at a time so it’s easy to monitor the cooking process. I like to use a metal spyder to push the wontons down into the oil to completely submerge them. Since the filling is not raw, the color change of the wontons is the main concern and best indicator for when they’re ready to be removed from the oil. Keep a close eye on the pot, they cook fast! It’s important to keep the deep frying oil temperature below its smoke point. Any higher and the oil can breakdown and release a chemical called acrolein that gives a burnt taste to food. Also at this point, the oil breaks down faster, so make sure to pick a high smoke point oil like peanut, canola, or vegetable for prolonged frying. Crab rangoon recipe for crispy deep-fried wontons stuffed with a seafood and cream cheese filling. Mix together crab meat, cream cheese, chives, salt, and pepper in a medium bowl. Add 1 tablespoon (15g, 1/2 ounce) of crab filling into the center of the wonton wrapper. Lightly brush the edges of the wonton wrapper with water. Bring two opposite points together and press corners together. Bring the other opposite edges together to create a purse shape. Seal the long side edges together removing as much air as possible. Repeat with remaining wonton wrappers. Heat vegetable oil in a large pot, dutch oven, or wok until it reaches 350ºF (177ºC), do not exceed 375ºF (191ºC). Deep fry crab rangoon wontons, 4 at a time until golden brown and crispy, about 1 to 1 1/2 minutes. 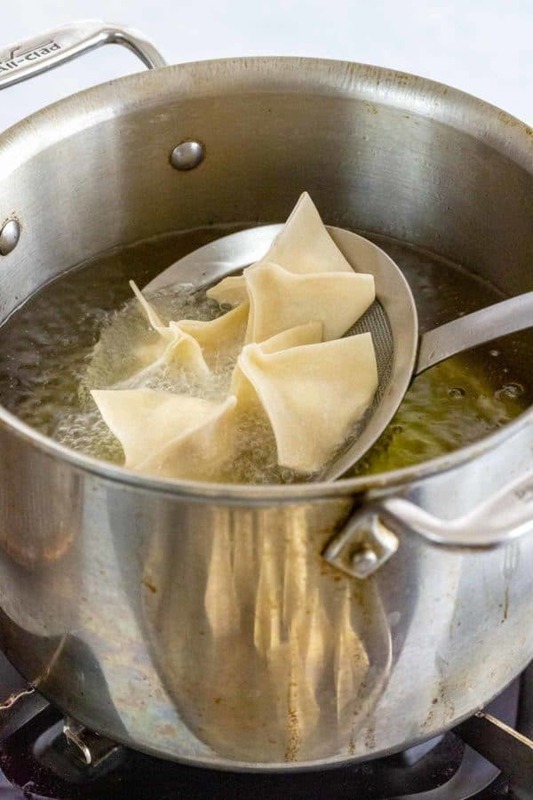 Use a metal spider or large spoon to keep the wontons submerged for even frying. Check the color change visually for the best indication of when the wontons are done frying. 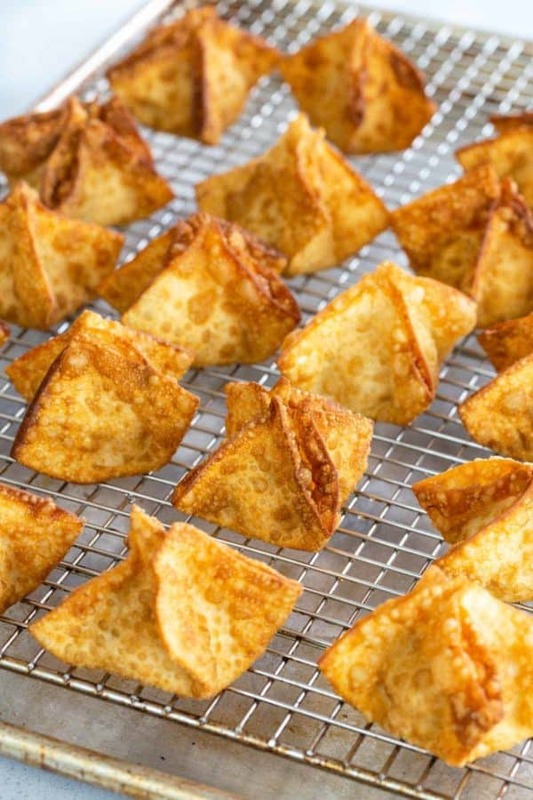 Transfer fried wontons to a sheet pan topped with a cooling rack or lined with a paper towel to drain excess oil. Repeat frying with remaining wontons. Serve immediately with the desired dipping sauce like sweet and sour sauce. Use 2 to 3 teaspoons of crab filling. Imitation crab may also be used. Use square wontons, 3 1/2 by 3 1/2-inches in size. Watch the oil temperature, if it goes above 375ºF (191ºC), the wontons will fry very quickly, within 30 seconds. You can also create a triangle shaped fold, or a tortellini shape with the filled wonton wrapper. 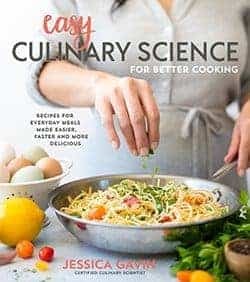 HiJessica….here I go again….I really struggle with deep fry recipes and asked you about baking egg rolls (followed you advice and turned out wonderful) and I have also oven baked potstickers in a similar manner to your bacon wrapped shrimp (HUGE hit at my place). Now, I love crab ragoons so I plan on doing the same again….will I be okay???? Massive Chinese New Year party coming to my place on Feb.8th …Massive….in Fernie BC!!! !,,,,so I want my appetizers out of the oven while my guests enjoy your Wonton Soup recipe ( it is a request/demand again this year) while I whip up your Pad Thai recipe and veggie stir fry (love the sauce). Will also be adding slow cooker ginger beef and slow cooker sweet and sour chicken. 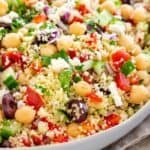 Would love your thoughts and recipes and any advice is appreciated. I was a high school principal in China for 9 years…..and I come back to Canada and make food I never made there…………What is that???? Thank you! Hi Sarah- Wow, sounds like you have a big feast ahead! Are you planning on baking or frying the rangoons? You can definitely shape them ahead of time and refrigerate, then fry them right before serving.